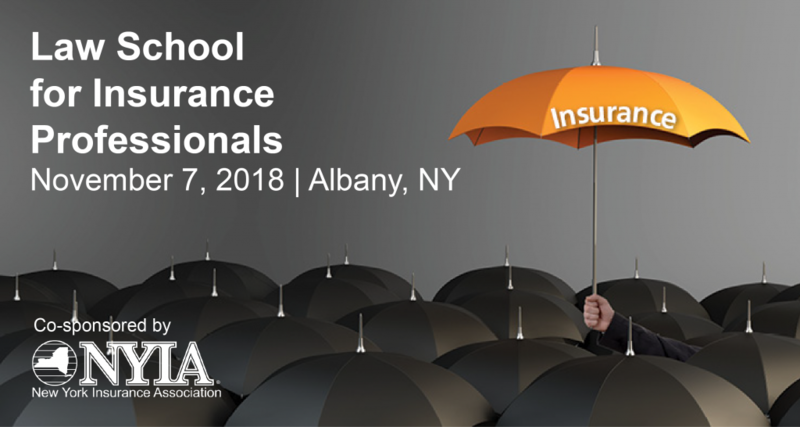 Attend this unique program designed to provide non-attorneys with insurance legal know-how and the opportunity to interact with some of New York’s top insurance and defense attorneys. NYIA appreciates the opportunity to partner with the New York State Bar Association to offer this program to our members. NYIA in partnership with NYSBA is a proud co-sponsor of this event and is pleased to offer our members a 10% discount. When: Wednesday, November 7, 2018 | 8:30 a.m. – 4:30 p.m.
View all options on the registration page. Can’t attend in person? For the first time, Law School for Insurance Professionals is available online on demand with a video recording available following the program date. Contact Kaitlyn Emory at kemory@nyia.org for your NYIA member coupon code. This course does not offer MCLE or CE credit. Attendees at the live program in Albany will receive a certificate of attendance. Both attorneys and insurance professionals can benefit from attending this seminar.